Corporative Sans Rounded is a rounded sans serif typeface created by Latinotype Team and published by Latinotype which is part of Corporative Sans, available in 8 weights (from Hair to Black) & 2 widths (Rounded, Rounded Alternates) with accompanying italics, a standard set of 350 characters and almost 130 language support. With rounded terminals, has a friendly and strong personality which it merge perfectly for both display & small sizes. Also works well on logo, poster, magazine, packaging etc. Enjoy! Price: starting from $26 for one font to $189 for all 32 fonts. 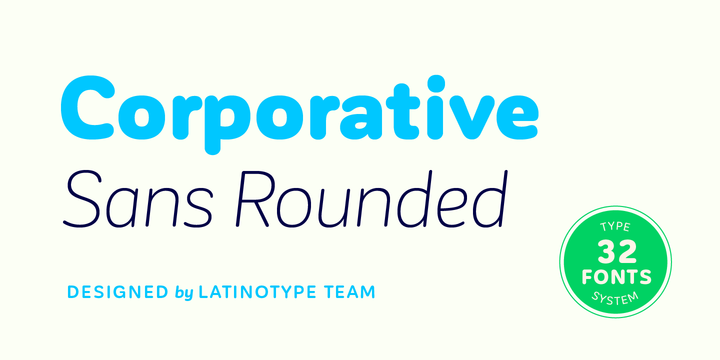 A font description published on Monday, April 11th, 2016 in Fonts, Latinotype, Latinotype Team by Alexandra that has 2,623 views.